Is OroLotto a Scam or Legit? Read Reviews! OroLotto Exposed — You Won’t Be Surprised! If OroLotto.com looks familiar, it is yet another site powered by Lottoyard. This seems to be a template that a whole bunch of online lottery providers is using. That isn’t to say this site for playing lottery lines and syndicates isn’t legit. It’s just boring. They have the usual top lotteries, multi-play discounts and bonuses including tell a friend. So, is there anything different here? 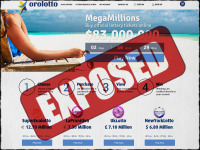 Currently, OroLotto.com offers EuroMillions & EuroJackpot, US Powerball & Mega Millions & New York Lotto, Lotto 649, La Primitiva, SuperEnalotto, BonoLoto, El Gordo and UK Lotto. There is a minimum of two or more lines for each order depending on the lottery. Fill in for only one line and it will automatically add another or more quick pick lines. Discounts apply for multi-draws ranging from 2% for 2 draws up to 25% for 52 draws. There are some discounts for subscriptions, but this changes for each lottery. OroLotto matches the amount spent with bonus money. This can’t be withdrawn, but can be used to play more tickets. There is also an automatic ‘free’ Mega Millions ticket for a share in a group play though no information on how many others are in the syndicate. There is also a “Welcome Bonus” and “Tell a Friend Bonus” of a free share in a group play. OroLotto.com also offers a money back guarantee on your 1st purchase if you’re unhappy. Players have a choice of playing either straight ticket lines or group play for each of the lotteries. It appears they use the system of one ticket line and then all the bonus combinations, but there is nowhere to see your actual ticket numbers – well I think you do once you make the purchase. There are 150 shares for 50 lines for each draw. They say that they will have a facility to “create your own group” soon meaning you get to invite your friends to play plus you can choose your own numbers. Any jackpot win at OroLotto.com will be in the form of a lump sum even if the lottery offers the annuity choice. Your winnings come less fees and commissions, handling charges, taxes (where applicable) and other levies and fees – none of which are specified. Oh, they do say under “Cash Out” that they take no commissions so the previous reference might refer to the provider on how you get your money. There is a minimum €5 withdrawal amount and they say payment will be “as soon as reasonably possible”. If you have questions, OroLotto.com is available Monday to Friday 9:00 am to 6:00 pm GMT with a UK telephone number and live chat. Hang on – so why claim 24/7 support. That’s on their home page. There is also an email address and snail mail address for Estonia. That’s where the “operator” is registered. So, why the UK phone number? Would you mind rating OroLotto.com? This online lottery provider is pretty straightforward and as I said before boring. The customer service is only available during GMT business hours despite the fact they claim support 24/7. I also don’t particularly like the fact that they use the term “as soon as reasonably possible” when we’re talking about getting my winnings. After much discussion, the team gave OroLotto.com a thumb’s down. The bonus of a share in a pool with no details was the straw that broke the camel’s back. Boring? Maybe, just straight forward, easy to use, online only lottery messenger site. Pretty decent and works well.